NO QUESTIONS ASKED MONEY BACK GUARANTEE! 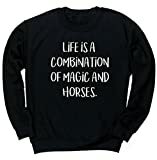 This is a premium quality, 50% cotton 50% polyester, machine washable, long sleeve unisex jumper which is hand made to order. We use the finest quality clothing vinyl to create a vibrant print which will not crack or fade like other methods such as screen printing and transfer printing. We have used our years of experience to provide you with a high quality product which will not be matched at this price point. Available in sizes S 34/36″, M 38/40, L 42/44″, XL 46/48″, XXL 50/52″. This design is also available on women’s fitted t-shirts, children’s t-shirts, children’s and unisex hoodies, unisex t-shirts and baby vests. Please click HippoWarehouse to browse all our items.